This morning as we were getting ready to go to the hospital and meet with the surgeon I realized that I was not at all ready for today. I wasn't ready to see Rambo looking sick or abused. I wasn't ready to see him all cut up again. I wasn't ready for anything. Nonetheless, today was here and his surgery was happening whether I was ready or not. We sit down with the same surgeon who has worked on Rambo before and you can tell he'd not pleased he has to do this one. He tells us straightforwardly that Rambo has a 50/50 chance at surviving the surgery. 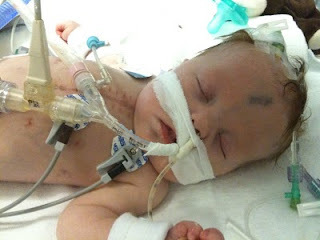 And if he does survive he will almost definitely be on ECMO - a heart lung bypass machine. I have seen this machine on several children in the PICU and hoped never to see my child on one. You have to be completely sedated and paralyzed and each day you are on it is a day closer to not getting well at all. I had a feeling that this was coming so after he told us that I tried to prepare myself for it but to no avail. I just could not see Theodore hooked up to ECMO. His surgery time comes and we walk him back - I think I did a pretty good job holding it together considering I was just told that my son may not live through this. And we wait. We wait and wait and wait. They usually call several times throughout the operation - at the first incision, when they hook up to bypass, when the repairs are done, when they are off bypass, etc. But we haven't heard a word from them this time. It's been 2 hours and I'm starting to wonder what is happening back there. Then Ben and I look up to see the surgeon standing right in front of us. He's definitely NOT supposed to be there. What is going on? Where is Rambo? Don't tell me something I don't want to hear. And then he says "A miracle." No lie, a doctor actually said miracle - that never happens. They got him in the OR put in all the central lines and IV accesses they needed and did one final echo - the heart is functioning well. And not only is it functioning well but the leaking of the valves is even less than it was on a good day for Rambo. Praise God! I was stunned - I still am. I guess Theodore likes scaring the crap out of me. But I'm thankful God had a different plan. My little man lives to see another day! Unfortunately, this also means we've fallen a little behind on the steampunk plan. For now, I'll take what I can get. I'll start fashioning his brass and leather joints for his steampunk transformation. I've got the brass goggles covered. I'm thinking a total Jules Verne nursery would be amazing. I think you've got this one to watch. He has the Taylor penchant for elaborate practical jokes. He's good. All kidding aside you were blessed to see a miracle today. The word miracle has become trite in our world. How I wish It would be reserved for use only to describe true supernatural occurrences. In every sense of the word this is a miracle. God took your little man on quite an adventure today. there is no better healer then our God! he uses our drs but He is the true healer! such a wonderful update! prayers still coming for you and him!